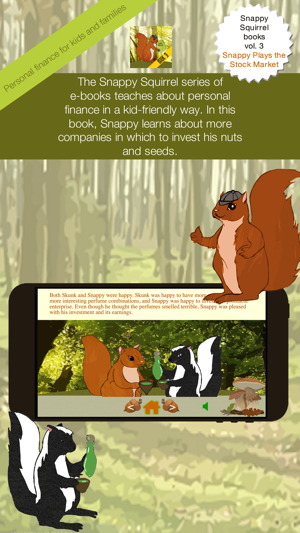 In Book 3, The Snappy Squirrel series of e-books continues as Snappy feels the need to diversify his financial portfolio. After consulting with Auntie Pip and researching various companies in the forest, he decides to make another investment in an up-and-coming forest corporation, Skunk's Perfumes. Snappy learns a valuable lesson about researching companies and choosing in which ones to invest. 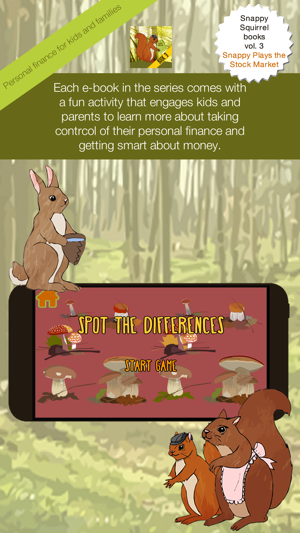 -Click the mushroom in the pleasant summer scene as you read, and be inspired to embark on stimulating discussions about your own family's financial choices. -Each Snappy book includes a fun game - this volume includes a challenging "spot the differences" game with an outdoors, forest theme. 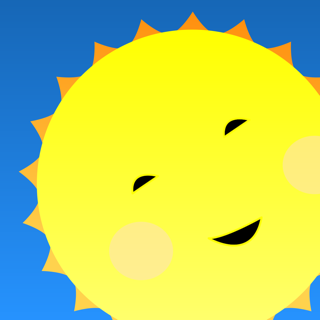 Kids and families can learn about investing in solid businesses side-by-side along with Snappy Squirrel.